Ever since my second unexplained pregnancy loss I’ve been on a mission to remove toxic products from my diet and lifestyle. Skincare and makeup play a huge part because there are ingredients that can impact your fertility. Today I thought I’d share what I’m using for makeup these days. I’ll do a separate post on this, but the last product I put on my face before starting on my makeup is Hynt Beauty Sunprep SPF25. It’s my AM moisturizer, my primer, and my sunscreen all in one. I always wear this, whether or not I wear makeup. It’s the only sunscreen that does not make my skin mad, something that has been a challenge over the years. It’s also very lightweight, which is perfect for an oily gal such as myself, and it absorbs quickly. Oh, and it smells REALLY good! I haven’t found a ride-or-die foundation yet, but I’ve tried a few that I like so far by Crunchi and 100% Pure. Currently, I am using 100% Pure Bamboo Blur Tinted Moisturizer. Don’t be fooled by the name – it is a foundation! It’s a mattifying formula based on their Bamboo Blur Powder (which I also use), and it’s the ideal product for someone whose makeup is usually running down their face by the end of the day. Seriously, this stuff lasts, and I love it! Under my eyes, I use the 100% Pure 2nd Skin Concealer. I really like how the formula goes on – not to liquidity and not too cakey. I also wanted something that was going to do more than just cover up, and since it’s made with olive squalane it’s keeping my eye area hydrated. To set my makeup, I use the 100% Pure Bamboo Blur Powder. As mentioned, I’m an oily gal so this does a fantastic job of making sure I stay matte all day. I’m not really big on bronzers because I like to keep my contouring more subtle. I’ve enjoyed using Zuzu Luxe’s Mosaic Illuminator in 1 to add a bit of color. And then for blush I’m currently using the Nu Evolution Pressed Blush in Cosmopolitan. Eyeshadow – It was hard to break up with my Urban Decay Naked palettes at first… that was until I discovered Lily Lolo’s palettes. Not only are they clean, but I actually like the color options a lot better. The pigmentation is much better too. Eyeliner – I tend to go back-and-forth between pencil and liquid eyeliner. I’m currently using 100% Pure’s Liquid Eyeliner, but once I am done with it I am going to give some other brands a try. When I’m not in the mood for liquid I use Juice Beauty PHYTO-PIGMENTS Precision Eye Pencil. And to brighten my eyes, I use 100% Pure’s Bright Eyes Creamy Long Last Liner. 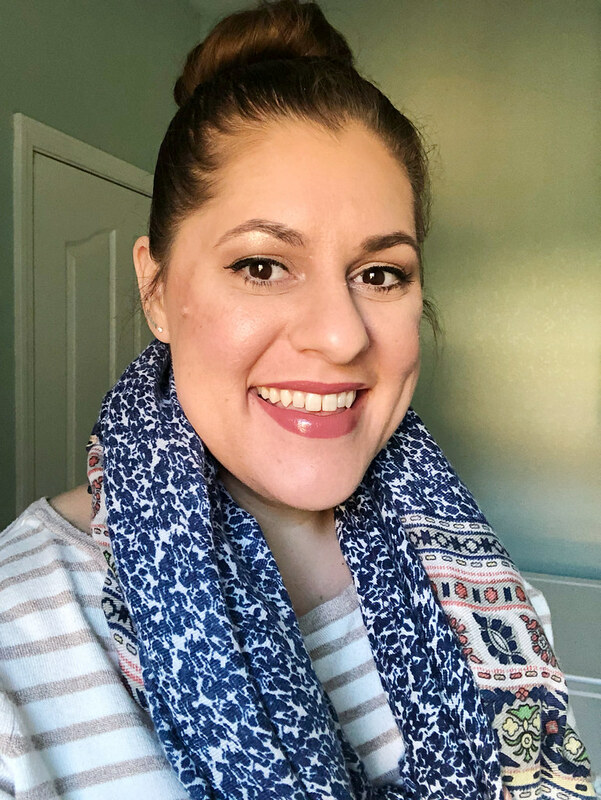 Mascara – I have two favorite mascaras so far, which is a pretty big deal considering I didn’t really have one before switching to clean beauty. My first favorite is the Fitglow Good Lash Mascara. It’s both a mascara and lengthening serum. My second favorite, which I am using right now, is by Lily Lolo. Brows – I start with combing out my brows with a brush and then I’ll contour by adding a bit of HAN Skin Care Illuminator in Champagne underneath my lower brows. I absolutely LOVE the 100% Pure Green Tea Fiber Brow Builders! I will use this on my brows to give them a clean filled in color. Since I subscribe to a handful of green beauty boxes, my lip product collection has grown without me really trying. I think I’ve only bought two or three lipsticks. Everything else has been part of those beauty boxes. Two of my favorites are 100% Pure Pomegranate Lipstick in Zinnia and Fitglow Beauty Lip Colour Cream in Beach.